After four vintages under their belt producing solely Estate wine, Marciano Estate is one of the newest cult wineries to emerge in Napa Valley. As their fruit has matured and gained more depth since their 2011 debut vintage, winemaker Andy Erickson has produced exceptional 2015 Reds from this west St. Helena vineyard. Marciano Estate was once a part of the famed Bourn Vineyard that was owned by the overarching Hayne Family. It was originally developed in 1857 and was comprised of 20 acres under vine. Today, thanks to the careful guidance of David Abreu’s vineyard management team, the vineyard is now at its best to date, with 10-acres planted to Cabernet Sauvignon, Merlot, Cabernet Franc and Petit Verdot. Combined with Andy Erickson’s winemaking skills (think Dalla Valle, Favia), the mature Douglas fir trees protecting the vineyard and the impressive winery designed by one of Napa Valley’s best, Howard Backen, Maurice Marciano has spared no expense and cut zero corners to bring to life this historic property. As importantly, he understands patience and that in time, good estates can become great with continued commitment and investment. I have tasted each of these offerings in previous vintages and thought they were very sound wines but not great wines. It is their 2015 vintage I believe that is now showing the true potential of this site. On the same alluvial fan as their nearby vineyard neighbors to the north (think Abreu Madrona, Abreu Cappella, Spottswoode), there is an intrinsic fruit profile, structure and secondary notes in these current offerings that are markers for great west St. Helena vineyards. 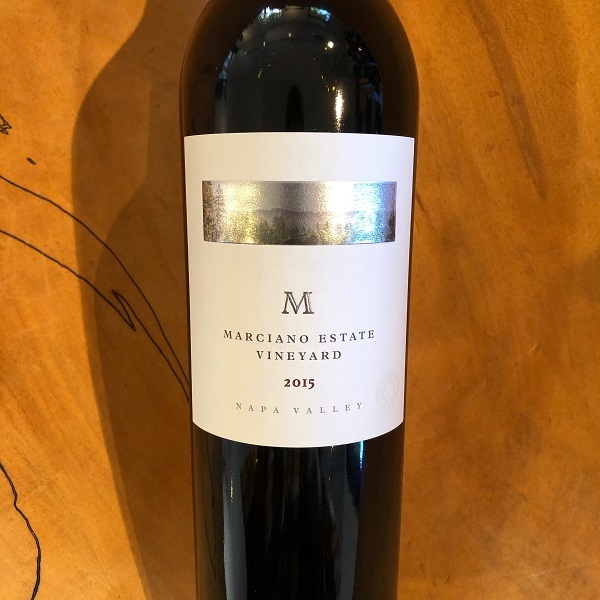 Both 2015 vintage Reds could use a bit more time in the bottle but if you open them, let them sit for a few hours or decant and you’ll begin to see the beauty of Marciano Estate. “The 2015 M Red wine boasts aromas of black cherry, crème de cassis, violet and espresso. On the palate, the Cabernet Sauvignon adds beautiful concentration, lush fruit flavors and incredible depth. Conditions in 2015 were ideal for the Cabernet Franc, which achieved perfect ripeness and contributed to the wine’s expressive bouquet and silky, refined texture. The addition of Petit Verdot completes the blend, resulting in a seamless wine, and showcasing the complexity and amplitude of our ten-acre estate vineyard.” 583 cases were produced.